"me gustaria señalar la excelente atencion al cliente que hay junto con la..."
Obelisk of Tourmaline or Lapis lazuli with the Reiki symbols engraved. 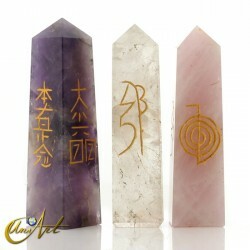 This Reiki driver in obelisk form has the Reiki symbols engraved on each of its four sides. Measures between 2 cm and 2.50 cm of base, and between 8 and 10 cm of height, and weighs about 100 grams. 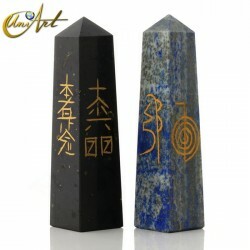 You can have this obelisk in two stones: Black Tourmaline or Lapis Lazuli. Narmada jasper point carved in 8 facets. These points have a mix of brown and beige colors which is typical of the Narmada jasper. This is because the Narmada Jasper is a rock that is composed of jasper, agate and basalt. Measures of the Narmada jasper points: Weight: between 35 and 40 grams. Average size: 8 cm high. The measures are varied. 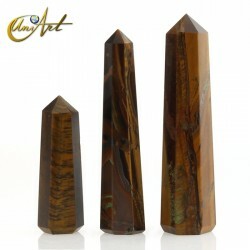 Buy now these magnificent natural stones with obelisk shape and quartz points. 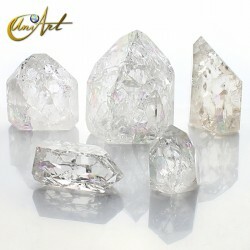 They are made with the finest materials and crystals, such as quartz, tourmaline, crystal quartz and white quartz. 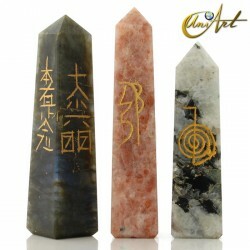 The points and obelisks are used for channeling energy and are widely used both in reiki and in gemotherapy, as they also can be loaded and programmed. 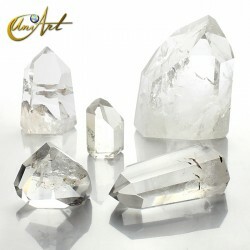 The white quartz generates and transfers positive energy, while it blocks and transmutes negative energy. To buy wholesale, refer to the "Wholesaler Zone".